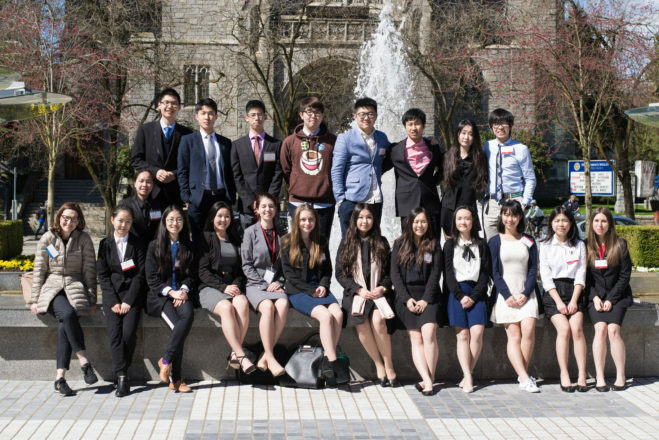 On March 31st, 28 delegates from our Mount Doug Model United Nations Club attended CAHSMUN 2017, the largest 3-day Model United Nations conference in Vancouver. The event took place in the Sheraton hotel downtown, with over 800 bright young students from across North America, including Victoria, Vancouver, Calgary, Toronto and Seattle. Model United Nations is a simulation of the United Nations geared toward high school students. From learning about each country’s foreign policy to experiencing the stress of waking up at 12 a.m for a midnight crisis, students fully understand what it takes to be a diplomat. The conference not only provides a hands-on opportunity for students to understand diplomacy and negotiation, but also allows students to make long lasting friendships. Throughout the three days of conference, students deliberated topics meant to change our world such as the threat of overpopulation and impact of counterfeit goods. In doing so, our students made their first speech representing a country and were involved in drafting a resolution paper. Students have come back from the conference enlightened, inspired and more conscious of global issues. I founded Mount Doug’s Model UN club two years ago in pursuit of raising global awareness of our school. Since then, it has been a surreal experience for me to take part in such initiative.